Forty Winks - Saint Ives - Cambridgeshire - England. A small friendly Bed & Breakfast. 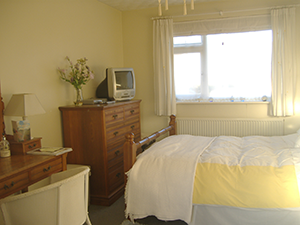 The only Bed & Breakfast in the historic market town of St. Ives, Cambridgeshire. Located only 12 minutes walk to the town centre and very convenient for the business area. Excellent links by the Guided bus to Cambridge every 10 minutes and by train to London and Peterborough. Our St Ives Bed & Breakfast is like home from home. Special diets can be catered for and Vegetarians are very welcome. There is digital TV in the rooms with free wifi, tea/coffee, chocolate biscuits and bottled water. Lovely down pillows and duvets, tell me if you are allergic and I will change them! We like good children and good dogs. Forty Winks Bed & Breakfast was awarded 4 Stars in 2008 and has won gold in St Ives Gardens in Bloom.